A 12" with the Hex remixes of "La Negra Celina" is scheduled for release on november 23 !! 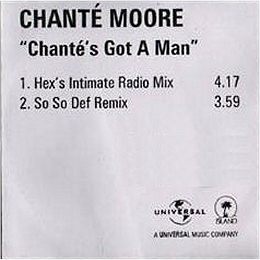 Click here for the track listing. I found an additionnal Hex remix of PROYECTO UNO's "PUMPIN'" on a double promo 12" : "The Percapella". The way Hex played with the vocals is really funny and makes this mix very enjoyable if you liked his "Peak Hour Vocal" mix. Get a glimpse here. 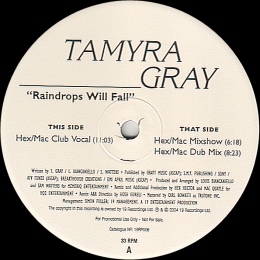 I got myself a copy of the promo 12" featuring the Hex/Mac mixes of TAMYRA GRAY's "RAINDROPS WILL FALL". There's something strange about this remix. Actually, after a few listennings, i kind of got bored of the "raindrops will fall" vocal loop used throughout the Vocal Mix. The thing i can't explain is while i quickly got tired of the full vocal mix, the mixshow version really grew on me !! It's the very first time that i prefer a mixshow rather than a full mix. Must be because of the less use of vocal loops and ad-libs... The dub is great (for the same reason i guess..), very dark and powerfull. All and all, this is a very good take from Hex and Mac. Click the pic to get sound samples. I learned about the existence of a very rare U.K promo CD featuring exclusives Hex Hector and Dezrok remixes of MEL C's "I TURN TO YOU". This 6 tracks CD features 3 exclusives remixes : the Main Club Instrumental, the Ambiance and the Echo-Pella mixes (these last 2 were shared on some download sites as "String Vocal Mix" and "String-A-Pella"). I'm really looking forward to finding a copy of this rare gemm !! Click the pic for full details. 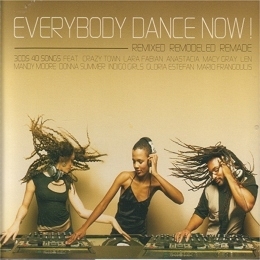 Last, i bought a copy of the Sony 3 CD compilation called "EVERYBODY DANCE NOW" because it featured the unreleased "HQ² Radio Vocal Mix" of JADE ANDERSON's "SUGAR HIGH". It's alway great to gather these Hex mixes.... Click the Pic for a sample.